Home Wishes Sankranti May your life be blessed with happiness. Happy Makar Sankranti! May your life be blessed with happiness. Happy Makar Sankranti! May your life be blessed with love. May your life be blessed with lakshmi May your life be blessed with happiness. 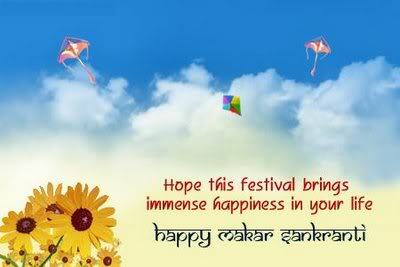 Happy Makar Sankranti!. Makar Sankranti – also known by the name of Pongal in South India and Maghi in Punjab – is among the most auspicious occasions celebrated by Hindus in all parts of India as well as Hindu communities such as Nepal and others. Thousands of people take a dip in the Ganga or pray to the Sun God in what is otherwise regarded as a harvest festival celebrated by zealous Hindus with much cheer, devotion and fanfare. Said to have a very profound spiritual significance, Sankranti refers to the transitional phase when the Sun passes through the house of Sagittarius to the house of Capricorn. It is a holiday of new commitments and new resolutions.